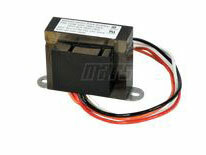 The MARS-2 Control Transformer 50203 is a 40VA transformer that powers 24 Vac circuits in HVAC systems. This is a NEMA transformer (Class II). Class II power transformers include power transformers with high‐voltage windings from 115 kV through 765 kV. This 40 VA transformer can compare to or replace the following popular control power transformers: Global GT4031F, Jard 4031F, Honeywell AT140A1018, AT40A1121, AT40A1139, AT140B1214, Universal UET105, UET115, Steveco / White Rodgers 90-T40F3, Packard PF42440. This 24vac 40VA transformer can be used in lieu of Honeywell transformers when installing our popular Honeywell UV Air Treatment systems. Honeywell recommends using a transformer to supplement the existing power source. If your system has an existing transformer it is likely adequate, but you can be sure by adding a transformer.